Abstract: Formulating the many-to-many routing optimization problem from a matching perspective has the benefits of reducing the computational complexity. 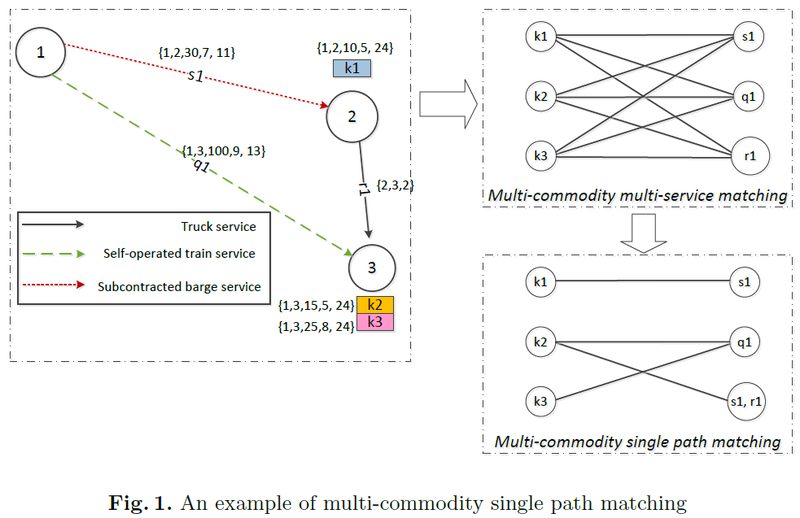 This paper researches the multi-commodity multi-service matching problem of synchromodal hinterland container transportation. To improve the computational efficiency, this paper proposes a many-to-one algorithm to solve the many-to-many matching problem. We assess the performance of the proposed method with 56 random instances of the problem, and perform sensitivity analysis to analyze the influence of different demand patterns. Reference: W. Guo, W.W.A. Beelarts van Blokland, R.R. Negenborn. A many-to-one algorithm to solve a many-to-many matching problem for routing. Accepted for the 9th International Conference on Computational Logistics (ICCL 2018), Vietri sul Mare, Italy, October 2018.